LOS ANGELES -- The mother of a 17-year-old honors student who was among 10 people killed in a fiery Northern California bus crash sued FedEx on Tuesday, alleging that its trucks have a history of catching fire. 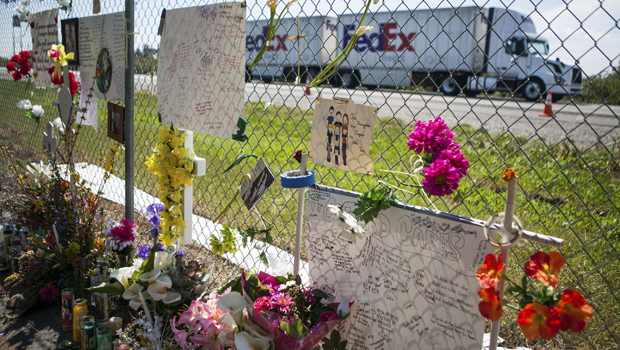 The negligence suit that seeks $100 million in damages is the first filed in connection with the April 10 freeway crash in Orland, said A. King Aminpour, the attorney for the plaintiffs. The suit was filed in Los Angeles County Superior Court on behalf of Rosa Rivera, mother of Jennifer Bonilla of Los Angeles. The Dorsey High School student had earned a college scholarship. She and other teens were heading north for a free tour of Humboldt State University when the bus was struck head-on by a FedEx truck. Dozens escaped through windows before the bus exploded into towering flames, but five students, three adult chaperones and both drivers died. "She had her whole future before her," Aminpour said of Bonilla. "She was the first in her family to ever go to college." The California Highway Patrol has not determined the cause of the crash 100 miles north of Sacramento. Some witnesses reported that the FedEx truck was on fire before the crash, and the lawsuit alleges that FedEx trucks have a history of catching fire from mechanical problems, driver error or improper cargo loading. "Our heartfelt condolences remain with everyone affected by this tragic accident," Memphis, Tenn.-based FedEx Corp. said in a statement. "We remain focused on providing support to those affected and cooperating with the authorities as they conduct their investigation. This is not the time for us to discuss potential litigation." The suit also names the estate of the FedEx driver and the bus owner, Silverado Stages, as defendants. The bus lacked adequate exit doors that would have allowed passengers to escape after the crash, the lawsuit contends. A message seeking comment from a Silverado Stages executive after hours Tuesday was not immediately returned.